Charles IX (27 June 1550 – 30 May 1574) was King of France from 1560 until his death in 1574 from tuberculosis. He ascended the throne of France upon the death of his brother Francis II in 1560. Charles was the twelfth king from the House of Valois, the fifth from the Valois-Orléans branch, and the fourth from the Valois-Orléans-Angoulême branch. After decades of tension, war broke out between Protestants and Catholics after the massacre of Vassy in 1562. In 1572, after several unsuccessful peace attempts, Charles ordered the marriage of his sister Margaret of Valois to Henry of Navarre (the future King Henry IV of France), a major Protestant nobleman who was in the line of succession to the French throne, in a last desperate bid to reconcile his people. Facing popular hostility against this policy of appeasement, Charles allowed the massacre of all Huguenot leaders who gathered in Paris for the royal wedding at the instigation of his mother Catherine de' Medici. This event, known as the St. Bartholomew's Day massacre, was a significant blow to the Huguenot movement, though religious civil warfare soon began anew. Charles sought to take advantage of the disarray of the Huguenots by ordering the Siege of La Rochelle, but was unable to take the Protestant stronghold. Much of his decision making was influenced by his mother Catherine de' Medici, a fervent Roman Catholic who initially sought peace between Catholics and Protestants, but after the St. Bartholomew's Day Massacre supported the persecution of Huguenots. 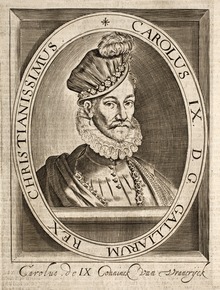 Charles died of tuberculosis without legitimate male issue in 1574 and was succeeded by his brother Henry III. Portrait of Charles IX shortly after acceding to the throne, by François Clouet. He was born Charles Maximilian, third son of King Henry II of France and Catherine de' Medici, in the royal chateau of Saint-Germain-en-Laye. 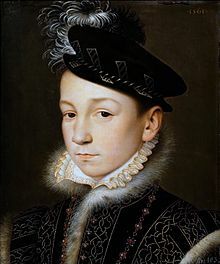 Styled since birth as Duke of Angoulême, he was created Duke of Orléans after the death of his older brother Louis, his parents' second son, who had died in infancy on 24 October 1550. The royal children were raised under the supervision of the governor and governess of the royal children, Claude d'Urfé and Françoise d'Humières, under the orders of Diane de Poitiers. On 14 May 1564, Charles was presented the Order of the Garter by Henry Carey. His father died in 1559, and was succeeded by his elder brother, King Francis II. 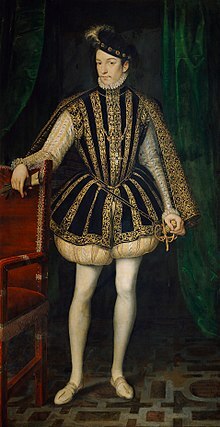 After Francis's short rule, the ten-year-old Charles was immediately proclaimed king on 5 December 1560. When Francis II died, the Privy Council appointed his mother, Catherine de' Medici, as governor of France (gouvernante de France), with sweeping powers, at first acting as regent for her young son. On 15 May 1561, Charles was consecrated in the cathedral at Reims. Antoine of Bourbon, himself in line to the French throne and husband to Queen Joan III of Navarre, was appointed Lieutenant-General of France. Charles' reign was dominated by the French Wars of Religion, which pitted various factions against each other. The Huguenots, the French adherents of Calvinism, had a considerable following among the nobility, while their enemies, later organised into the Catholic League, were led by the House of Guise, a cadet branch of the House of Lorraine. Queen Catherine, though nominally a Catholic, initially tried to steer a middle course between the two factions, attempting to keep (or restore) the peace and augment royal power. The factions had engaged in violence even before Charles' accession: in 1560 a group of Huguenot nobles at Amboise had planned to try to abduct King Francis II and arrest the Catholic leaders Francis, Duke of Guise, and his brother Charles, Cardinal of Lorraine. The plot was found out ahead of time, and the Guises were prepared, executing hundreds of Huguenots. This was followed by cases of Protestant iconoclasm and Catholic reprisals. The regent Catherine tried to foster reconciliation at the Colloquy at Poissy and, after that failed, made several concessions to the Huguenots in the Edict of Saint-Germain in January 1562. Nonetheless, war broke out in Wassy on 1 March 1562, when the Duke of Guise and his troops attacked and killed or wounded over 100 Huguenot worshipers and citizens. The tragedy is identified as the first major event in the French Wars of Religion. Louis of Bourbon, Prince of Condé, brother of the Lieutenant-General and the suspected architect of the Amboise conspiracy, had already prepared for war and, taking Wassy as the pretext, assumed the role of a protector of Protestantism and began to seize and garrison strategic towns along the Loire Valley. In return, the monarchy revoked the concessions given to the Huguenots. After the military leaders of both sides were either killed or captured in battles at Rouen, Dreux, and Orléans, the regent mediated a truce and issued the Edict of Amboise (1563). Charles IX as an adult, by François Clouet. The war was followed by four years of an uneasy "armed peace", during which Catherine tried to unite the factions in the successful effort to recapture Le Havre from the English. After this victory, Charles declared his legal majority in August 1563, formally ending the regency. However, Catherine would continue to play a principal role in politics and often dominated her son. In March 1564, the King and his mother set out from Fontainebleau on a grand tour of France. Their tour spanned two years and brought them through Bar, Lyon, Salon-de-Provence (where they visited Nostradamus), Carcassonne, Toulouse (where the King and his younger brother Henry were confirmed), Bayonne, La Rochelle, and Moulins. During this trip, Charles IX issued the Edict of Roussillon, which standardised 1 January as the first day of the year throughout France. War again broke out in 1567 after reports of iconoclasm in Flanders prompted Charles to support Catholics there. Huguenots, fearing a Catholic attack was imminent, tried to abduct the king at Meaux, seized various cities, and massacred Catholics at Nîmes in an action known as the Michelade. The Battle of Saint-Denis resulted in a Huguenot defeat and the death of Anne de Montmorency, the royal commander-in-chief, and the short war ended in 1568 with the Peace of Longjumeau. The privileges granted to Protestants were widely opposed, however, leading to their cancellation and the resumption of war. The Dutch Republic, England and Navarre intervened on the Protestant side, while Spain, Tuscany and Pope Pius V supported the Catholics. Finally, the royal debt and the King's desire to seek a peaceful solution led to yet another truce, the Peace of Saint-Germain-en-Laye in August 1570, which again granted concessions to the Huguenots. On 26 November 1570 Charles married Elisabeth of Austria, with whom he fathered one daughter, Marie Elisabeth of Valois. In 1573, Charles fathered an illegitimate son, Charles, Duke of Angoulême, with his mistress, Marie Touchet. After the conclusion of the Peace of Saint-Germain-en-Laye in 1570, the king increasingly came under the influence of Admiral Gaspard de Coligny, who had succeeded the slain Prince of Condé as leader of Huguenots after the Battle of Jarnac in 1569. Catherine, however, became increasingly fearful of Coligny's unchecked power, especially since he was pursuing an alliance with England and the Dutch. Coligny was also hated by Henry, Duke of Guise, who accused the Admiral of having ordered the assassination of his father Francis of Guise during the siege of Orléans in 1562. During the peace settlement, a marriage was arranged between Charles' sister Margaret of Valois and Henry of Navarre, the future King Henry IV, who was at that time heir to the throne of Navarre and one of the leading Huguenots. Many Huguenot nobles, including Admiral de Coligny, thronged into Paris for the wedding, which was set for 18 August 1572. On 22 August, a failed attempt on Coligny's life put the city in a state of apprehension, as both visiting Huguenots and Parisian Catholics feared an attack by the other side. In this situation, in the early morning of 24 August 1572, the Duke of Guise moved to avenge his father and murdered Coligny in his lodgings. As Coligny's body was thrown into the street, Parisians mutilated the body. The mob action then erupted into the St. Bartholomew's Day massacre, a systematic slaughter of Huguenots that was to last five days. Henry of Navarre managed to avoid death by pledging to convert to Catholicism. Over the next few weeks, the disorder spread to more cities across France. In all, up to 10,000 Huguenots were killed in Paris and the provinces. Though the massacres weakened Huguenot power, they also reignited war, which only ceased after the Edict of Boulogne in 1573 granted Huguenots amnesty and limited religious freedom. However, the year 1574 saw a failed Huguenot coup at Saint-Germain and successful Huguenot uprisings in Normandy, Poitou and the Rhône valley, setting the stage for another round of war. In the aftermath of the massacre, the king's fragile mental and physical constitution weakened drastically. His moods swung from boasting about the extremity of the massacre to exclamations that the screams of the murdered Huguenots kept ringing in his ears. Frantically, he blamed alternately himself – "What blood shed! What murders! ", he cried to his nurse. "What evil counsel I have followed! O my God, forgive me... I am lost! I am lost!" – or his mother – "Who but you is the cause of all of this? God's blood, you are the cause of it all!" Catherine responded by declaring she had a lunatic for a son. Charles' physical condition, tending towards tuberculosis, deteriorated to the point where, by spring of 1574, his hoarse coughing turned bloody and his hemorrhages grew more violent. On his last day, 30 May 1574, Charles called for Henry of Navarre, embraced him, and said, "Brother, you are losing a good friend. Had I believed all that I was told, you would not be alive. But I always loved you... I trust you alone to look after my wife and son. Pray God for me. Farewell." Charles IX died at the Château de Vincennes, aged twenty-three years. As his younger brother, Henry, Duke of Anjou, had recently been elected King of Poland and was away from France, their mother Catherine resumed the regency until Henry's return from Poland. Charles had an interest in hunting, and he wrote a book on the subject, La Chasse Royale, which was published long after his death, in 1625. It is a valuable source for those interested in the history of hounds and hunting. Charles IX is a supporting character in Alexandre Dumas's 1845 historical novel Queen Margot, which focuses on the marriage between Henry of Navarre and Margaret of Valois. The book depicts Charles as both a cold-hearted king who takes pleasure in the hunt, and a lonely and vulnerable man, influenced in politics by his relatives and allies. In this work of fiction, he is a frail and sickly ruler, and dies after reading a book poisoned with arsenic, which his mother intended for Henry of Navarre. In the 1994 film, La Reine Margot, directed by Patrice Chéreau, which is based on Dumas's novel, Charles is pictured as mentally unstable and sickly. He has a small role in the Doctor Who story "The Massacre of St Bartholomew's Eve", portrayed by Barry Justice. The story portrays him as a kindly but weak-willed king who is dominated by his mother and persuaded by her to authorise the massacre despite his friendship with Coligny. In the first season of the CW show Reign, Charles IX is a recurring character portrayed by Peter Dacunha. He is mentioned, but never shown, in the second season. He becomes a more prominent character in season three before becoming a main character in season four. Charles IX is one of the few characters in the series to have been recast and is now portrayed by Spencer MacPherson. As king, Charles IX shows little enthusiasm for the job. ^ Heritier, p. 48; Frieda, p. 69. ^ Leslie Stephen, "Henry Carey," Dictionary of National Biography 9 (London 1887), p. 68. Carew was himself a Knight of the Garter (1561). ^ Salmon, p. 124–137. Sutherland, p. 111–138. ^ Jouanna et al., p. 181-185; Knecht, p. 151. ^ Jouanna et al., 196–204. ^ Jouanna et al., p. 213; Knecht, p. 181. ^ Charles IX, La Chasse Royale (1625). ^ a b Anselme 1726, pp. 131–132. ^ a b c d e f Whale 1914, p. 43. ^ a b c d Anselme 1726, pp. 210–211. ^ a b Anselme 1726, pp. 126–128. ^ a b c d Tomas 2003, p. 7. ^ a b Anselme 1726, p. 209. ^ a b Anselme 1726, pp. 207–208. ^ a b Anselme 1726, pp. 463–465. ^ a b Tomas 2003, p. 20. ^ a b Anselme 1726, p. 324. Wikimedia Commons has media related to Charles IX of France. Frieda, Leonie (2003). Catherine de Medici. New York: Harper Collins. ISBN 0-06-074492-8. Jouanna, Arlette; Boucher, Jacqueline; Biloghi, Dominique; Thiec, Guy (1998). Histoire et dictionnaire des Guerres de religion (in French). Collection Bouquins. Paris: Laffont. ISBN 2-221-07425-4. Knecht, Robert J. (2000). The French Civil Wars. Modern Wars in Perspective. Harlow: Longman. ISBN 0-582-09549-2. Tomas, Natalie R. (2003). The Medici Women: Gender and Power in Renaissance Florence. Aldershot, UK: Ashgate. ISBN 0-7546-0777-1. Whale, Winifred Stephens (1914). The La Trémoille family. Boston, Houghton Mifflin. p. 43. Catherine de' Medici, daughter of Lorenzo II de' Medici and Madeleine de La Tour d'Auvergne, was an Italian noblewoman who was queen of France from 1547 until 1559, by marriage to King Henry II. As the mother of kings Francis II, Charles IX and Henry III, she had extensive, if at times varying, influence in the political life of France. From 1560 to 1563, she ruled France as regent for her son Charles IX, King of France. 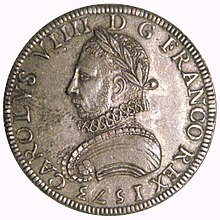 Francis II was King of France from 1559 to 1560. He was also King consort of Scotland as a result of his marriage to Mary, Queen of Scots, from 1558 until his death in 1560. Francis was the eleventh king from the House of Valois, the fourth from the Valois-Orléans branch, and the third from the Valois-Orléans-Angoulême branch. Henry III was King of France from 1574 until his death and also King of the Polish–Lithuanian Commonwealth from 1573 to 1575. Henry was the thirteenth king from the House of Valois, the sixth from the Valois-Orléans branch, the fifth from the Valois-Orléans-Angoulême branch, and the last male of his dynasty. The St. Bartholomew's Day massacre in 1572 was a targeted group of assassinations and a wave of Catholic mob violence, directed against the Huguenots during the French Wars of Religion. Traditionally believed to have been instigated by Queen Catherine de' Medici, the mother of King Charles IX, the massacre took place a few days after the wedding day of the king's sister Margaret to the Protestant Henry III of Navarre. Many of the most wealthy and prominent Huguenots had gathered in largely Catholic Paris to attend the wedding. Gaspard de Coligny, Seigneur de Châtillon was a French nobleman and admiral, best remembered as a disciplined Huguenot leader in the French Wars of Religion and a close friend and advisor to King Charles IX of France. Henry I, Prince of Joinville, Duke of Guise, Count of Eu, sometimes called Le Balafré (Scarface), was the eldest son of Francis, Duke of Guise, and Anna d'Este. His maternal grandparents were Ercole II d'Este, Duke of Ferrara, and Renée of France. Through his maternal grandfather, he was a descendant of Lucrezia Borgia and Pope Alexander VI. Louis I de Bourbon, Prince of Condé was a prominent Huguenot leader and general, the founder of the House of Condé, a cadet branch of the House of Bourbon. Francis de Lorraine II, Prince of Joinville, Duke of Guise, Duke of Aumale, was a French soldier and politician. By religion, he practised Catholicism, at a time when France was being polarized between the Catholics and Huguenots. His sister, Mary of Guise, was Queen of Scotland as wife of King James V of Scotland and she was the mother of Mary, Queen of Scots. Henri I de Bourbon, Prince of Condé was a French Prince du Sang and Huguenot general like his more prominent father, Louis I, Prince of Condé. Claude of France was a French princess as the second daughter of King Henry II of France and Catherine de' Medici, and Duchess of Lorraine by marriage to Charles III, Duke of Lorraine. Margaret of Valois was a French princess of the Valois dynasty who became queen consort of Navarre and later also of France. By her marriage to Henry III of Navarre, she was queen of Navarre and then France at her husband's 1589 accession to the latter throne. Their marriage was annulled in 1599 by decision of the Pope. She was the daughter of King Henry II of France and Catherine de' Medici and the sister of kings Francis II, Charles IX and Henry III. Her marriage, which was intended to celebrate the reconciliation of Catholics and Huguenots, was tarnished by the St Bartholomew's Day massacre, and the resumption of the religious troubles which ensued. In the conflict between Henry III and the Malcontents, she took the side of Francis, Duke of Anjou, her younger brother, and this caused the king to have a deep aversion towards her. The Massacre of Wassy, also known as the Massacre of Vassy, is the name given to the murder of Huguenot worshippers and citizens in an armed action by troops of Francis, Duke of Guise, in Wassy, France on 1 March 1562. The massacre is identified as the first major event in the French Wars of Religion. The series of battles that followed concluded in the signing of the Peace of Amboise the next year, on 19 March 1563. Charles de Bourbon was a French cardinal. The Catholic League considered him the rightful King of France after the death of Henry III of France in 1589. Catherine de Bourbon was a Navarrese regent. She was the daughter of Queen Joan III and King Anthony of Navarre. She ruled the principality of Béarn in the name of her brother, King Henry IV of France, from 1576 until 1596. Catherine de' Medici's court festivals were a series of lavish and spectacular entertainments, sometimes called magnificences, laid on by Catherine de' Medici, the queen consort of France from 1547 to 1559 and queen mother from 1559 until her death in 1589. As queen consort of Henry II of France, Catherine showed interest in the arts and theatre, but it was not until she attained real political and financial power as queen mother that she began the series of tournaments and entertainments that dazzled her contemporaries and continue to fascinate scholars. Biographer Leonie Frieda suggests that "Catherine, more than anyone, inaugurated the fantastic entertainments for which later French monarchs also became renowned". Eléanor de Roucy de Roye, princesse de Condé was the eldest daughter and heiress of Charles, seigneur (sire) de Roye and de Muret, comte de Roucy. Her mother, Madeleine de Mailly, dame de Conti, was the daughter of Louise de Montmorency and half-sister of Admiral Coligny, d'Andelot, and Cardinal de Châtillon. Eléanor was the first wife of Louis I de Bourbon, prince de Condé; as such, she was the sister-in-law of Antoine of Navarre and aunt of King Henry IV.